Sponsors Needed for the Creativity Shell's 2nd Annual Munchkin Market! Sponsors Needed for the Creativity Shell’s 2nd Annual Munchkin Market! The Creativity Shell is a 501(c)(3) nonprofit organization on a mission to use creative trades to educate and inspire the next generation of makers. Our organization teaches sewing/textile arts and other trades classes to students in our private studio, public libraries, schools and shelters that rescue children from homelessness and human trafficking. Our classes are designed to educate and inspire children by teaching them essential life and practical skills. 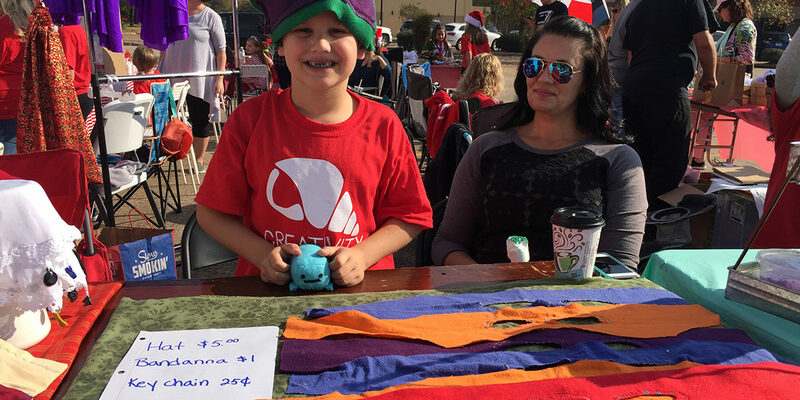 On Saturday, December 1, 2018, the Creativity Shell will host our annual Munchkin Market at the Kingwood Shopping Center. This public event will consist of K-12 students from all over Houston converging to sell their own handmade goods. The students will have the unique chance to gain business, social, financial literacy and entrepreneurial skills as they interact with real customers and real currency. The Munchkin Market is also a wonderful opportunity for the local kids of Houston to shine as the next generation of makers! We are asking you or your organization to help sponsor the Munchkin Market. Your tax- deductible donation will sponsor the cost of tent rentals and tables for student to sell their handmade goods. In addition, this sponsorship will include the purchase of raw materials and supplies to make the handmade goods as well as provide free workshops for the students to make their items in our Kingwood studio in preparation for the market. Sponsors will be highlighted with “thank you” rewards including (but not limited to) name recognition on the table you sponsor, inclusion in the program booklet for the Munchkin Market, logos on the Creativity Shell website, our social media pages, and more! With your donation, the Creativity Shell will continue to fulfill our mission to educate and inspire the next generation of makers!